The 12th Annual CWF Rumble will feature 30 entrants battling it out for a shot at any title they choose in the future! We’ve announced 20… and now we’re up to 25 today! Only 5 more left as we are 1 week away from this historic bout to be broadcast LIVE on iPPV! 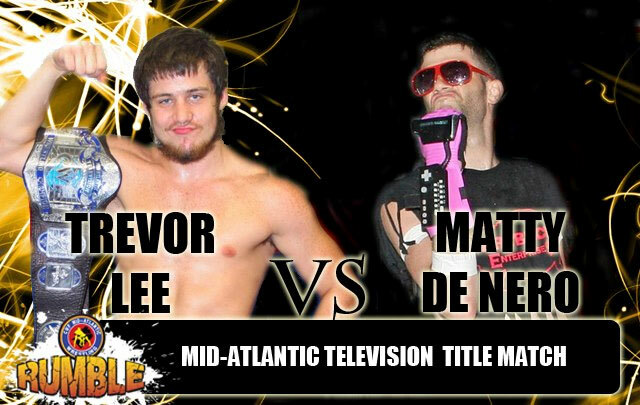 After wresting the Mid-Atlantic Television Title from Fatback Enterprises member, Donnie Dollars, new champion Trevor Lee will defend against another Fatback member at the CWF Rumble! De Nero has been called the “heart and soul” of Fatback Enterprises. Can he win the Television Title and bring it back to Fatback or will Trevor Lee’s fun, athletic reign as champ roll on?! Huge tag team title bout announced for the CWF Rumble on iPPV! 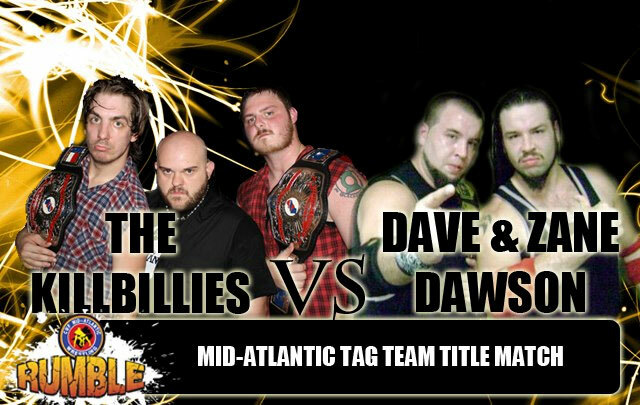 Dave and Zane Dawson have won every major tag-team championship in North Carolina except for one – the CWF Mid-Atlantic Tag-Team Championship. On Saturday October 20th the bruising brothers get their first chance at CWF gold against the undefeated Appalachian supermen, the Killbillies! A special singles bout has been confirmed for the 12th Annual CWF Rumble to be broadcast on iPPV on Saturday, October 20, 2012. 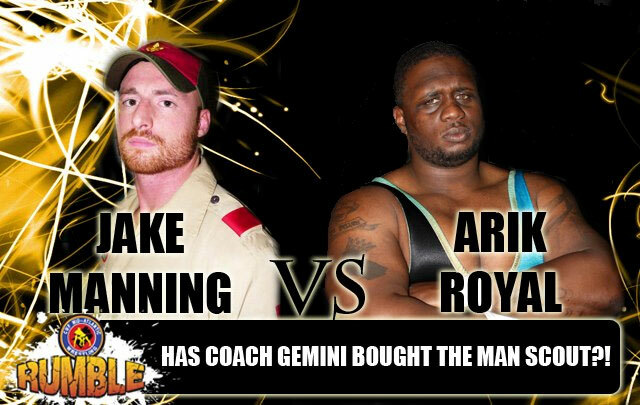 The 2012 Johnny Weaver Memorial Cup Winner, Arik Royal, will take on the challenge of Jake “Man Scout” Manning. This match will highlight the only 2-Time Weaver Cup Winner, Arik Royal, against $5 Wrestling’s creative genius and wrestling standout, Jake Manning. There have been rumblings that Arik Royal is on the “hit list” of self-proclaimed “player-coach” of the All-Stars, Coach Gemini, and this match is a direct result of his negotiations with the CWF Mid-Atlantic’s Championship Committee. Will this be the the straight up wrestling contest it should be (and the way Freight Train would want it) or does the Coach have a devious plan to take Arik Royal out of title contention from the All-Stars MVP, Ray Kandrack, and his Mid-Atlantic Heavyweight Crown? The CWF Rumble is now up to 20 entrants… only 10 more remain! Coach Gemini has managed to get an “All-Star” edition with the newest entrants including 4 of his All-Stars. ArenaChicks.com is proud to announce their first ever iPPV feature match to be held October 20, 2012 as part of the 12th Annual CWF Rumble. This historic match for the ArenaChicks will pit Sassy Stephie vs. Kellie Skater. The winner of the match will advance to the “Final Four” on the road to crown the first ever ArenaChicks Champion. Already reaching the “Final Four’ include Jazz, Angel Orsini, Reby Sky, and the final spot will be decided on October 20th. Sara Del Rey originally was in the “Final Four” but had to withdraw due to her signing a full-time contract with WWE. Commissioner Shelly Martinez then created a “play in” match where Reby Sky defeated Amber O’Neal to claim SDR’s slot. Don’t miss this incredible match PLUS the ArenaChicks will be represented in the 30-person Rumble as both Kellie Skater and Amber O’Neal will be entrants!!! CWF RUMBLE 2012 – Five more entrants announced up to 15 now! Today we confirm 5 more names as we can tell you MARCELLUS KING, MARK JAMES, AMBER O’NEAL, $5 Wrestling Champion FREIGHT TRAIN and “The 1st” RIC CONVERSE have joined the field! Marcellus King returned to CWF at Absolute Justice following a nearly 2 year hiatus and immediately targeted Ric Converse and the Aftermath. Converse got his hand raised in their first meeting on Sep 22nd through controversial means and now both are in CWF’s most prestigious annual match. Mark James is a ring veteran of 10+ years and if the luck of the draw is favorable to him, his toughness and durability makes him someone to contend with. The amazingly popular $5 Champion Freight Train will be with us live on iPPV and he’s another one who has a great chance of being the last man standing if the luck of the draw goes in his favor. And lastly Amber O’Neal, long regarded as the first lady of CWF Mid-Atlantic, has recently confirmed plans to enter her 4th CWF Rumble. October is shaping up to be a busy month for O’Neal as she takes on Reby Sky on Friday October 5th in Charlotte and will face the intergalactic luchadora Saturyne when Chikara makes a stop at the Mid-Atlantic Sportatorium on Sunday October 7th. We will be announcing more names for the 12th Annual CWF Rumble NEXT week so make sure to stay connected with us on twitter @cwfmidatlantic! 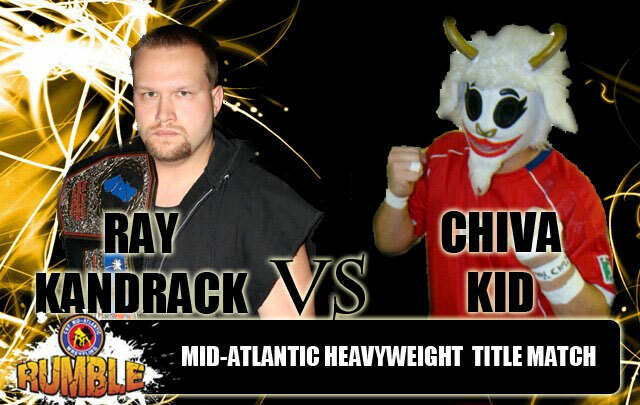 Chiva Kid to challenge Ray Kandrack for the Mid-Atlantic Hwt Title! CWF Rumble 2012 – Five New Entrants Announced! On Monday September 10th the first FIVE confirmed names for the 30 Person Rumble Match were announced as: Aftermath “apprentice” CHET STERLING, recent CWF dojo graduate CHRIS LEA, “Surly” CECIL SCOTT, the monstrous MECHA MERCENARY and female wrestling star KELLIE SKATER. On Monday September 17th the next five confirmed names for the Rumble Match were announced as: KAMAKAZI KID, NICK RICHARDS, MATTY DE NERO, TREVOR LEE and BEN TYLER. Kazi is one of CWF’s most decorated longtime stars, having held nearly every championship under the CWF banner. But a Rumble win is one thing that’s eluded the daredevil Kamakazi Kid for all these years. And if the 400 pound Mecha Mercenary has anything to say about it, this won’t be Kazi’s year either. Immediately after the announcement of Kazi as a confirmed Rumble participant, the bionic behemoth proclaimed intentions to not just throw Kazi over the top rope and eliminate him, but break his back in the process! Fatback’s Nick Richards has been struggling lately. He put on a great showing in the Weaver Cup Tournament but came up short. He took Mid-Atlantic Champion Ray Kandrack to the limit but came up short. A Rumble win would break Richards out from the pack of rising stars and solidify him as a top dog in the Mid-Atlantic. Perhaps he could take a cue from his partner in Fatback Matty de Nero, who won this very Rumble match back in 2007. De Nero is a resilient fighter and a proven survivor and if the luck of the draw is kind to him you never know what could happen. Then there’s Trevor Lee and Ben Tyler, the Aftermath’s Fun Athletic Guys. Mandated by William Cross to prove themselves worthy of the Aftermath name, one has to believe that no matter where they stand with Cross by the time October 20th rolls around that either would be welcomed back with open arms if they were the last man standing in this year’s Rumble Match. CWF Rumble 2012 – First entrants announced! CWF Mid-Atlantic’s 12th Annual CWF Rumble will be held Saturday, October 20, 2012 live from the Mid Atlantic Sportatorium in Gibsonville, NC and broadcasted live worldwide on internet Pay-Per-View! On Monday September 10th the first FIVE confirmed names for the 30 Person Rumble Match were announced as: Aftermath “apprentice” CHET STERLING, recent CWF dojo graduate CHRIS LEA, “Surly” CECIL SCOTT, the monstrous MECHA MERCENARY and female wrestling star direct from Australia, KELLIE SKATER. This will be our first look at both Sterling and Lea, though both have taken drastically different paths to their pro debuts. Chet gained infamy last December when he disrupted the main event at Battlecade 12 in one of 2011′s most shocking moments. We later learned Chet was a former CWF wrestling school trainee expelled due to a poor attitude and sense of entitlement. The Aftermath’s William Cross saw something in Chet’s attitude and recruited him as his “apprentice” placing him as the manager for the Aftermath’s Trevor Lee and Ben Tyler. Chet is said to be a talented athlete held back from advancing in the CWF Dojo by his selfish attitude. By contrast Chris Lea is a humble, focused, driven young man who has received high marks for months now from his trainers at the CWF Dojo. A jack of all trades, Lea also hosts the CWF Live Event updates on our YouTube account (http://www.youtube.com/cwfmidatlantic) and is on the air weeknights 12-6 AM at the triad’s leading hip-hop station 102 JAMZ. For months now Cecil Scott and the 400 pound Mecha Mercenary have proven themselves to be one of the Mid-Atlantic’s most unstable tag-teams. However this could be their night as last year’s Rumble will always be remembered as the night Mecha dominated, eliminating more than one-third of the 29 other wrestlers by himself, shattering the all time record. If Cecil can hone Mecha’s brute force and rage effectively they could both be very dangerous in this year’s match. Australia’s “Rate Tank” Kellie Skater continues a CWF tradition of intergender Rumble participation that started with the very first one in 2001. She is often described as “indestructible” and considering that toughness she may stand the best chance any female’s ever had to win and be the last person standing at the end of the night. We will be announcing more names for the 12th Annual CWF Rumble NEXT week so make sure to stay connected with us on Twitter (@cwfmidatlantic)!